End of the Journey in Long Beach! Don Milne here to announce the end of our Roadtrip-'62 ™ journey along historic US-6. Today is day 36 and we are only 42 miles from the west end of the route in Long Beach, California. And to finish our westbound trip, we will drive several blocks eastbound right at the end. That strangely corresponds to the beginning of our trip, where we began our westbound trip by traveling eastbound for a ways out on Cape Cod, Massachusetts. All of today will be within the Los Angeles metropolitan area, the largest urban area of our trip. As I mentioned yesterday, we won’t see any more US-6 signs along the way, because California removed them all back in 1964. So, I’ll be referring to our route as “old US-6” the rest of the way. We will stop at some museums and of course, places related to movies and TV, and end within sight of the Pacific Ocean. If you see anything you like, I encourage you once again to get yourself out on the road and enjoy it in person. This virtual roadtrip has been fun for me, and I hope for you, but there's nothing like the real thing! At any time, click on an underlined word below to learn more about the places on the trip. Let’s get back on the road again! We stayed last night at the mid-century modern Pink Motel in Los Angeles’ Sun Valley neighborhood. And today, we will see other buildings, signs, highways, and attractions from the period around 1962. Today, we will also see our last mountains, as the Verdugo Mountains will be on the left side all morning as we drive through Burbank and Glendale, California. Let’s get started down San Fernando Boulevard through Burbank and find some breakfast! Actually, let’s take a trip a couple of miles off San Fernando Boulevard, alongside the Bob Hope Airport, and have breakfast at the Coral Café, which has been serving up breakfast since 1957. Of course, that means it’s an old diner located in an outdated building, but the menu is interesting. What other diner have you been to that has Swedish Pancakes with Lingonberry syrup, or scrambled eggs with choices like pepperoni, gyro meat, or a Kobe beef patty? Driving back to old US-6 after eating, we again pass the first thing we saw as we entered Burbank, the Bob Hope Airport. That’s a perfectly Hollywood type name for an airport, though it was known (in order) as the Union Air Terminal, Lockheed Air Terminal, Hollywood-Burbank Airport, and Burbank-Glendale-Pasadena Airport, from its founding in 1930 until 2003. The 1962 Rand McNally Atlas lists it as Lockheed Air Terminal, and it was owned by the Lockheed Corporation at that time. Burbank was the location of Lockheed's Skunk Works, which produced some of the most secret and technologically advanced airplanes during the Cold War, including the U-2 spy planes that uncovered the Soviet Union missile components in Cuba in October, 1962. I’ve flown in and out from this airport and it’s a comfortable, small airport, compared to the giant and crowded LAX in Los Angeles. Up until recently, you still walked outdoors from the terminals to the planes! Bob Hope is definitely my favorite place to fly into Los Angeles. Also until recently, San Fernando Boulevard took old US-6 under the freeway directly to downtown Burbank. But the underpass was filled in during the past couple of years, so we now have to use Victory Boulevard and Burbank Boulevard to get back to old US-6. We also have to detour around the Burbank Town Center shopping mall that was built right over the road in 1991! Burbank is billed as the "Media Capital of the World" for good reasons. Many media and entertainment companies are headquartered or have significant production facilities here, including The Walt Disney Company, Warner Bros. Entertainment, ABC Studios, Nickelodeon, NBC, and Cartoon Network. Johnny Carson made the phrase "Beautiful Downtown Burbank" famous on the Tonight Show, which he broadcast from here beginning in 1972. He began hosting the show from New York City on October 1, 1962. The city did not start out in the entertainment business, but was largely a manufacturing location until the 1920s. We still saw a lot of industrial area near the airport, as the Union Pacific Railroad tracks run beside old US-6, but that changed as soon as we crossed the freeway. First National Pictures was one of the early movie companies, and was taken over by a company in the Warner Brothers empire in 1929. Walt Disney's company located its studio in town in 1939 and made plans for an early version of Disneyland here. Disney moved that project to Anaheim, California after the City of Burbank declared it did not want a “carney atmosphere” in Burbank and the property was deemed too small. NBC arrived in 1952, moving from its former location at Sunset and Vine in Hollywood, and started filming at the NBC Color City Studios. This was the first studio specially designed for color television broadcasting. They completed a multimillion-dollar, state-of-the-art broadcast complex in 1962. Many NBC television shows were filmed at the studios, just two miles off old US-6, including the Tonight Show from 1972 to 2009. I was in the audience for a show taping once. The Burbank facility was one of the few television-specific studios that offered tours to the general public, but they quit in 2012. NBC TV shows filmed at the studios in 1962 include The Andy Williams Show and Truth or Consequences. You can still get a tour of the Warner Bros. Studio, which takes you behind the scenes of the 110-acre backlot. Actual filming occurs around you, so you never know what you will see. The tour also visits The Prop Department and The Archive, which features two floors of movie and TV memorabilia. If you’re lucky, you may see some items or sets used in filming the 1962 release The Music Man. Separate from the tour, you can also be part of a studio audience for many current television comedy, talk, and game shows. Back in 1962, Warner was filming a number of westerns and detective shows on the backlot, including Cheyenne and 77 Sunset Strip. Let’s take the tour and see if there is anything we can recognize. If we were in Burbank at lunch time, it might be worth a visit to Bob’s Big Boy on Riverside Drive. This is the oldest remaining Bob's, built in the 1950s, and is now a national landmark. Its soaring pylon sign, open kitchen, neon exterior lighting, and big picture windows are all elements of Googie architecture, popular in the late 1950s and early 1960s. The style was designed to be noticed by and attractive to fast moving traffic. Bob’s is located about 4 miles off old US-6 and is near enough to the Warner Brothers Studio main gate that celebrity sightings are common. On the other hand, if we were here in the evening I might stop at DeBell Golf Course or the Starlight Bowl. DeBell opened in 1958 and is known for its Kikuyu grass fairways, changes in elevation, and interaction with local wildlife as you play. The Starlight Bowl is the local band shell, built in 1950. Besides hosting musical performances, you can enjoy stunning canyon views at the site in the hills northeast of Burbank. One of the more unusual things you can see in Burbank is the Rancho Equestrian District, along Griffith Park and the Ventura Freeway. This district takes advantage of 53 miles of horse trails and the Los Angeles Equestrian Center in Griffith Park, which offers horse shows, riding lessons and trail rides. The Rancho Equestrian District is zoned to allow residents to keep horses on their property and many of the homes have stables and horse stalls. You can regularly see people out riding their horses from the Ventura Freeway, which was completed in 1960. The neighborhood is near the Walt Disney Studio buildings, which unfortunately are the only major studio that does not run backlot tours. The buildings also serve as the corporate headquarters for the entire Walt Disney Company. Some sound stages and animation related buildings are original from 1940, as is the water tower, though it no longer is used to store water. Water towers, used to provide an emergency water supply in case of fire, were a standard feature of major Hollywood studios of that era. You can also still spot the towers at the Warner Brothers, Paramount and Sony Pictures (formerly MGM) lots. Some of these other studios are closer to other US-numbered routes, such as US-101 and US-66, so let’s leave them for a future Roadtrip-'62 ™. Before we travel through Glendale, California, it’s a good time to take a side trip off old US-6 and visit Los Angeles’ Griffith Park. The park has an entrance about a mile off our route, and in addition to the horse riding facilities I mentioned, it has a merry-go-round, miniature train ride, golf course, Autry National Center museum, Travel Town Museum, the historic Greek Theatre ampitheatre, and is home to the Los Angeles Zoo and Botanical Gardens, and the Griffith Observatory. All this is contained in a park of over 4,210 acres of both natural chapparal-covered land and landscaped parkland and picnic areas. The first 3,015 acres were donated by Colonel Griffith J. Griffith in 1896, along with a trust fund to help maintain the park after his death in 1919. Colonel Griffith was one of many men who made his fortune in California gold mine speculation. Griffith Park is the largest municipal park in the United States to include an urban wilderness area and the land ranges from 384 to 1,625 feet above sea level. You could literally spend several days enjoying the park! Much of this infrastructure dates from before 1962, so we could have spent our time at the park back then also. Even the zoo, one of the latest additions, was constructed beginning in 1956. And to top it off, you can see the famous Hollywood sign from a bluff in the park, though the sign is well beyond our 5-mile limit from old US-6. Because I won’t be spending several days here, I’ll have to pick and choose my sites. Because I like transportation related things, let’s try the Travel Town Museum, which was dedicated in 1952. Then, a short hike in the park: watch out for rattlesnakes! Beginning near Griffith Park, old US-6 follows the Los Angeles River south to the Pasadena Freeway. The river is famous for being almost completely reconstructed as a concrete channel, and often being dry because this is actually desert country. It was also the scene of much of the action of the 1954 film “Them”, which had the storm drains along the river used as tunnels for the colony of giant ants created by a radioactive accident. The next city on our route is Glendale, California, home to Forest Lawn Memorial Park, one of the most famous cemeteries in the country because of the celebrities buried there. Though it seems a bit odd to me, Forest Lawn also includes an art museum, which was named one of the Top 10 Free Museums in the country by Yahoo Travel. The museum was founded in 1957. Art is exhibited there and in several chapels on the property, so let’s take a look. The Memorial Court of Honor in the Great Mausoleum has reproductions of Michelangelo’s greatest statuary works, the Last Supper, and one of the largest and most well respected stained glass collections in North America, with over 1000 pieces. My 1960 brochure for the Forest Lawn shows that much of the artwork was already here at that time. Just a few of the celebrities interred at the cemetery prior to 1962 are author L. Frank Baum, actor Humphrey Bogart, Walt Disney’s mother Flora Call Disney and father Elias Disney, actor Errol Flynn, and Los Angeles City Engineer William Mulholland. We continue down San Fernando Boulevard, which not only was US-6 in 1962, but also carried US-99 all the way from the far north edge of Los Angeles where we met it yesterday, to Figueroa Street, where we will meet old US-66. On the way, we pass the former Seeley's Furniture Store in Glendale. The store is no longer operating and the building was recently purchased for a renovation. I hope they keep the great old sign on top and the exterior clock that faces the streets; they’re great retro looks. Speaking of old signs, if you’re in Glendale after dark, you can board a bus for the Neon Cruise tour at the Museum of Neon Art. The museum is too new for our timeframe, but the signs they show you are not. This is a narrated tour that discusses the neon signs firmly within the context of 20th century Los Angeles cultural history. And you can get a sense of other signs in their collection at the Museum of Neon Art website. Moving back into Los Angeles, we come to California’s oldest freeway, the Arroyo Seco Parkway. The first part of this freeway was opened in 1939 and comprised four tunnels designed to quickly move traffic between downtown and the cities of Burbank, Glendale, and Pasadena to the north. Highways US-6 and US-66 were rerouted onto the parkway, and that is the route we would have traveled back in 1962. Route US-66 would have traveled with us from this location to Sunset Boulevard, downtown. Highway US-99, which has been with us since Newhall Pass, would have headed east from here to continue to the Mexican border. The connection to the Golden State Freeway, US-101, was completed in 1962, as was the nearby Dodger Stadium. This new stadium gave the Los Angeles Dodgers, who moved here from New York in 1958, a permanent home. While Dodger Stadium was being built, the Dodgers played at the Los Angeles Memorial Coliseum, which we will pass later today. Architect Edward Fickett’s use of style and color gives the building a uniquely Southern California mid-century modern style. The team finished second in the National League in their first season here. The stadium was located in land adjacent to Elysian Park and Reservoir, Los Angeles’ second largest park. This area has been a park since 1781 and includes the Chavez Ravine Arboretum, which was planted in 1800s. It also includes the Ficus Tree Grove Picnic Area, in case you’re interested in picnicking in Los Angeles. In 1962, US-6 was on a freeway from here for the next 25 miles south, almost to the Pacific Coast Highway. Prior to the construction of the Harbor Freeway, US-6 traveled south on Figueroa Street. Let’s get off the freeway near the famous Four Level Interchange just north of downtown, to find a place for lunch. 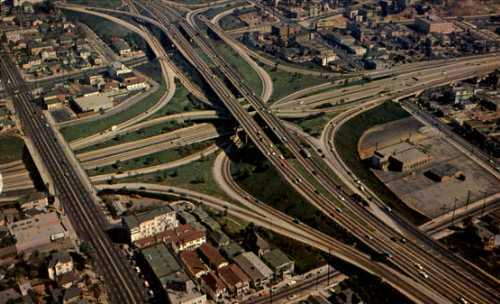 The Four Level Interchange was the centerpiece of the early freeway system in Los Angeles, as the first stack interchange in the world. It was completed in 1949 and fully operational in 1953, when the short extension of the Arroyo Seco Parkway opened. At the time it was built, the interchange was the most expensive half-mile of highway ever built, costing cost $5.5 million. And though it required far less property than a cloverleaf interchange, the construction displaced over 4000 people from their homes. This interchange also marked the convergence of several major highways in 1962, including US-6, US-66, and US-101. It also appears to have briefly been the western terminus of US-60 and US-70, though earlier, those two highways began east of here at the San Bernardino Freeway interchange with the Santa Ana Freeway. Historic route US-66 leaves us here to head for Hollywood. Highway US-101 is also known along much of its length through California as El Camino Real, the King's Highway. It closely traces the route of the historic road that connected the 21 missions of California from the Mexican border to the most northerly mission in the chain, Mission San Francisco Solano, in Sonoma. Some parts are also known as the Pacific Coast Highway. Highway US-101 historically ran 1,896 miles from Olympia, Washington to San Ysidro, California, at the Mexican border. Along with many other US-numbered routes, it was shortened by over 350 miles in 1964, and the south end is now in downtown Los Angeles. The former route headed easterly out of town through Whittier, La Habra, and Anaheim and has been replaced by the I-5 freeway. From near Oxnard, California to Capistrano Beach, California, there was also an alternate highway, US-101 ALT, which met our US-6 route in the Long Beach area. That section was changed to CA-1 in 1964. In the Los Angeles area, US-101 passes through the Hollywood district, which is too far from old US-6 for us to visit. We’ll just have to leave the following Hollywood tourist sites for a Roadtrip-'62 ™ trip along US-101. Attractions we will miss include the Hollywood Walk of Fame and the nearby Grauman’s Egyptian Theatre, Grauman’s Chinese Theatre, Hollywood Heritage Museum, Pantages Theatre, Paramount Pictures Studio and its tour, the Hollywood Bowl and Museum, and the famous eating places like Du-Par’s, Musso & Frank, Tiki-Ti, and the Formosa Café. All of these were present in 1962, though the Hollywood Walk of Fame just made it. The first star was that of Stanley Kramer, laid on March 28, 1960, and the walk was considered completed in the spring of 1961, with 1,558 stars laid. Today, we’re having lunch downtown at Clifton’s Cafeteria, billed as the largest public cafeteria in the world. Clifton’s opened in 1935 and while it eventually became a bit run down, it has recently been restored to its former interior glory, while installing modern restaurant equipment. During the recent restoration, one of the first things changed was the removal of the 1963 aluminum façade: the exterior has been restored to approximate what we might have seen in 1962. Clifton’s calls their interior a “Cabinet of Curiosities” and it does not disappoint. The main floor interior is a very unusual creation approximating a forest at twilight, complete with a five-story faux redwood in the Cathedral Grove, inspired by a grove of Coastal Redwoods in Muir Woods. They have retained an Art Deco era soda fountain and Map Room, a Tiki bar named Pacific Seas that has neon palm trees and waterfalls, and The Brookdale room that has a back bar affecting a Gothic church altar complete with soaring arches. I hope the food is as good as the décor! Now that we’re off the freeway, let’s take a look around the downtown area. Downtown Los Angeles looks a lot different today than it did in 1962. The city has had building booms from the early 1960s to the early 1990s, resulting in the completion of 30 of its 32 tallest buildings during that period. Before that, everything was shorter than City Hall, at 32 stories, the AT&T Switching Center, at 17 stories tall, and about a half dozen building of 11-14 stories. The reasons included government height restrictions and the frequency of minor earthquakes, but restrictions were lifted in 1957 and the high cost of land coupled with modern engineering has emboldened people to build ever higher here. Other smaller new buildings and parking garages have also been built during this period. But in a nice twist, most of the new projects were located west and northwest of the old historic core. So even though old US-6 on Figueroa Street passes through the new skyscraper canyons, we can still see the hundreds of buildings that look essentially the same as they did as far back as the 1930s if we drive around a bit. And there are a few architectural gems among those older buildings, well worth a walking tour to see the interiors. Los Angeles City Hall, built in 1928 and, as mentioned earlier, is the only skyscraper from the pre-1960 period. It has an observation deck on the 27th floor and tours used to be available, though I am not sure if they still are. Built in 1928 in a quirky mix of styles, the top of the building pays homage to an ancient mausoleum. Though often described as an Art Deco masterpiece, it also has influences from Egyptian, Greek, Roman, Romanesque and Byzantine design. Also worth a stop is the Richard J. Riordan Central Library. The library opened in 1926 and is a mix of Egyptian, Byzantine, and Spanish design. The second-floor rotunda of the old wing has a spectacular chandelier, decorated ceiling and wall murals. It houses over 2.1 million books and a half million historical photographs, and it offers docent-led tours. There is also the Millennium Biltmore Hotel, opened in 1923. This has an Italian Renaissance-style lobby full of columns and frescoes. The Rendevous Court is an amazing multi-story area with a wood panel and beam ceiling, giving the entire room the feel of the Biltmore Estate in Asheville, North Carolina. Presidents, kings and movie stars have stayed here since 1923. I’m sure this is one of the best places we could stay at the end of this trip: expensive but amazing. The Bradbury Building is a bit older, built in 1893 in a Renaissance-style. The five-story atrium finished with glazed bricks and wrought-iron grillwork with a cage elevator, should be familiar from the many movies filmed there. The Little Tokyo area, just east of downtown, includes the Nishi Hongwanji Buddhist Temple, which opened in 1925 and is the first Buddhist temple in Los Angeles. Since 1992, it has been home to the Japanese American National Museum. If you didn’t think Clifton’s Cafeteria was unusual enough and are still looking for someplace to eat near downtown, you can go to Grand Central Market, which opened in 1917. It reminds one of marketplaces in Europe and vendors serve Mexican, Chinese, Salvadoran, Japanese, Middle Eastern and other snacks and meals. Also just east of downtown, is the El Pueblo de Los Angeles Historical Monument, centered on Olvera Street. This is the oldest part of the city, founded in 1781. We have made our way from colonial times on the east coast, to colonial times on the west coast! There are twenty-seven historic buildings, with eleven open to the public as businesses or museums. One restored building is the Avila Adobe, the oldest house in Los Angeles, originally constructed in 1818. The monument also includes the Plaza church (Nuestra Señora La Reina de Los Angeles) constructed in 1822. The area was designated a state historic monument in 1953. There are several noteworthy churches near both old US-6 and downtown. Many churches are open to the public and you can make a nice architectural tour by simply stopping in. St. John’s Episcopal Cathedral is a massive stone building with an equally massive rose window. It’s a replica of an 11th century Italian church with mosaics throughout, located right on old US-6, just south of downtown. 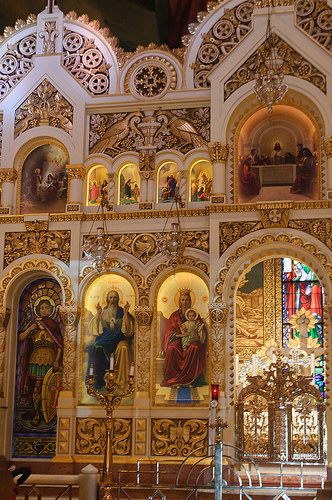 St. Sophia Cathedral Greek Orthodox is a magnificent Byzantine cathedral featuring stained-glass windows, murals, and gilded woodwork. The church lies just west of downtown and was completed in 1952. And just two miles west of downtown is First Baptist Church of Los Angeles, built in 1927. This Spanish gothic building has more than 130 rooms and a ceiling patterned after the chapel of the Ducal Palace in Mantova, Italy. We also find a number of great, older attractions in Los Angeles too far from old US-6 for us to visit. These include the Frank Lloyd Wright designed Hollyhock House, the Los Angeles County Museum of Art, the Page Museum at La Brea Tar Pits, and the Hammer Museum of Art. There are also worthy attractions to new for our 1962 trip, including the Los Angeles Maritime Museum, the Grammy Museum, Petersen Automotive Museum, Heritage Square Museum, and the FIDM (Fashion Institute) Museum and Galleries. Felix Chevrolet has been selling cars on Figueroa Street since 1921 and has a wonderful neon sign out front featuring Felix the Cat. The Felix character was borrowed from the popular cartoon "Felix the Cat" by pioneering automobile dealer Winslow Felix, who was a friend of filmmaker Pat Sullivan, whose animation studio created character. The original sign was erected in 1957 and a newer version has been added one block north. As we’re driving a 1962 Chevy Impala, this would be an appropriate place for a maintenance check. I should note that I’m staying on Figueroa Street even though US-6 had been moved onto the Harbor Freeway by 1962. The freeway is only 1-2 blocks off the street, so we’ll be passing the same places, but we will get to see more, and stop whenever we want, on the old road. We next pass the University of Southern California and Exposition Park, right next door. One of the features of Exposition Park is Los Angeles Memorial Coliseum, which is handy for the university as their USC Trojan football team plays here. The Coliseum was also home to the NFL’s Los Angeles Raiders from 1982 to 1994, the Los Angeles Rams from 1946-1978, and the Los Angeles Dodgers baseball team prior to completion of their own stadium in 1962. This is also the only venue in the world to have hosted two Olympic Games, in 1932 and 1984! Quite a sports venue, but I’m going to spend my time at museums. Exposition Park hosts the California Science Center, the Natural History Museum of Los Angeles County, and the California African American Museum, in addition to a rose garden. The site was originally created in 1872 as an agricultural park, where fairs were held, but is now a very urban type of park. Though the California Science Center only opened in 1998, the previous State Exposition Building on the site was remodeled to become the California Museum of Science and Industry in 1951, so we can consider this a replacement for what we would have seen on our roadtrip. The new museum has a lot of hands on displays of science for the kids. And even better, their outdoor exhibits of airplanes include an A-12 Blackbird spy plane that was first flown in 1962! Once we’re back outside, I’m walking through the Rose Garden, which is reported to have 200 varieties of roses along with its statues and a fountain. The garden was built in 1927 and the statues and fountain were added later. Beginning in 1940, the All-America Rose Selection, a rose growers organization, began donating its Rose of the Year to the plantings. The California African American Museum is too new for us, having opened during the Olympic Games of 1984, so let’s spend the rest of the afternoon at the Natural History Museum. There are permanent exhibits on mammals, birds, geology, gems and minerals, and more. And, they recently added a Dinosaur Hall where you can walk up close enough to look a Triceratops in the eye. I’ve always enjoyed the full-size dioramas of past times and places that many natural history museums have, and Los Angeles is right up there with the best with its mammal exhibits. There are also outdoor exhibits in the Nature Gardens, where you can also see local wildlife like butterflies, hummingbirds, squirrels, and snails. As Exposition Park is a sports venue, this seems like a good time to mention other sports around Los Angeles. I’ve already mentioned baseball and football, but being a major metropolitan area, there are plenty of other professional sports and some of them were here back in 1962 also. There are still two horse racing tracks in the area: Santa Anita Park and Los Alamitos Race Course. There were at least three tracks back in 1962, but the former Hollywood Park closed in 2013 and is now off-track simulcast betting only. It was known as the Hollywood Turf Club on a 1959 map I have. A new stadium for the Los Angeles Rams football team is being constructed on the site, scheduled to be open in 2019, while the Rams play at the Los Angeles Memorial Coliseum in the meantime. The Los Angeles Lakers basketball team moved here from Minneapolis in 1960. Los Angeles’ other NBA basketball team, the Clippers, moved here in 1984. Both now play at the Staples Center. Los Angeles also has an NHL hockey team, the Los Angeles Kings, which was formed in 1967. They used to play in The Forum, a stadium in nearby Inglewood, California, but now also play at Staples Center. And in the suburb of Anaheim, the Ducks play hockey and the Los Angeles Angels play baseball. Rounding out the sports offerings, the LA Galaxy is a professional soccer team and the Los Angeles Sparks plays professional women’s basketball. It’s time to finally leave the downtown area and head south to the end of former US-6, down your choice of either the old road of Figueroa Street of the Harbor Freeway, which was open before 1962. Figueroa Street starts as a mixed commercial and apartments environment. It has a smattering of older motels and industrial uses and then becomes primarily residential and churches, with more commercial at major intersections. It looks like the kind of area that should have had drive-in movie theaters, but I have not found records of any, other than one that wasn’t built until 1975. South of the I-105 freeway, the street crosses the Harbor Freeway and the area becomes a bit more industrial as a railroad appears a couple of blocks away. The buildings also become newer the farther south we drive and I suspect much of this area was developed after 1962. There is one spectacular site to visit about three miles off old US-6, The Watts Towers of Simon Rodia. These amazing towers of steel, concrete, and decorative glass and ceramic elements are the work of one man, Simon Rodia. Beginning in 1921, he worked for 34 years without using machine equipment, scaffolding, welding, or drawn designs. He used simple tools and a window-washer's belt and buckle for his safety equipment. Mr. Rodia finished in 1955 and sold the property, moving to be closer to family. Within a few years the City of Los Angeles ordered the towers demolished but a movement sprung up to save them. After the towers were given an engineering test in 1959 and found to be structurally sound, they were saved and have since been restored when time has worn them down. We can still view these sculptures and they are preserved for the future through designation as a National Historic Landmark, a State of California Historic Park, and a City of Los Angeles Historic-Cultural Monument. Continuing to the south, at the San Diego Freeway we cross another river. Like the Los Angeles River, it’s in a man-made channel, though it doesn’t appear to have a concrete bottom. The whole landscape is different once we get south to Carson, California: the developments are larger and newer. Some of the housing is mobile home parks and down in the Torrance, California area, there are some oil wells and oil tanks visible from old US-6. We turn left at the Pacific Coast Highway, which is currently CA-1 and was previously US-101 ALT. With that turn, we also re-enter the City of Los Angeles, in the Wilmington neighborhood. There are quite a few older motels along the road here, some of which were probably here in 1962, but I’m going to stay nearer to the end of our route in Long Beach. But I will be stopping for dinner here, at Der Wienerschnitzel, a hot dog fast food chain that began with this location in 1961. They are now the world’s largest hot dog chain. This building looks like a small Dairy Queen building and fittingly Der Winerschnitzel now sells soft-serve ice cream. In 2003, the company purchased the Tastee-Freez brand, a company founded in 1950 also along our US-6 route, in Joliet, Illinois. So we get a retro two-fer! Of course, I’ll have some ice cream for dessert, along with chili cheese fries, one of my favorite foods. As for the hot dogs, I think I’ll try the rueben; I like rueben sandwiches but have never had that as a hot dog. About a mile down the road is the Banning Museum, which has been part of Los Angeles’ Banning Park since 1927. The home is the former residence of Phineas Banning, often called “the Father of the Port of Los Angeles”, and was built in 1864. Most of the 23-room residence, together with the stagecoach barn, is open for tours showing how the family lived, worked, and entertained. It is the finest example of a Greek Revival home in Southern California and the interiors have been carefully restored to their Victorian period beauty. It’s too late for us to see it today, but I may come back tomorrow morning. Another place I won’t be stopping tonight is the Harbor Park Municipal Golf Course, just because I don’t feel like a round of golf. This course is 9-holes with a rolling layout and water hazards, built in 1958. The Banning Museum lies within a couple of blocks of a railroad yard, where we can get the first idea of the magnitude of transpacific shipping handled by the twin ports of Los Angeles and Long Beach. As we cross a bridge over the railroad tracks, there is an actual mountain of shipping containers to the north, at a rental yard. That’s about all we can see of the two largest ports in the United States from old US-6, as the ports are still south of here. The Port of Los Angeles handles around $1.2 billion worth of cargo comes every day through its 23 cargo terminals, 270 deepwater berths, and 77 container cranes. San Pedro Bay, where both ports are located, was used as a trading post by the Spanish for their nearby missions. The port was dredged and major breakwater improvements were made in 1912, just in time to take advantage of the increase in shipping that occurred when the Panama Canal opened in 1914. The Port of Long Beach came into the picture later, as the area was still mudflats at the mouth of the Los Angeles River in 1911. Most of the intial construction occurred during the 1920s. Sea-Land Services began their first container operation in 1962, becoming the first West Coast port to use this innovative cargo handling system developed on the East Coast in 1956. The area around the ports is of course industrial, with shipping containers parked and moving on trucks all around. There are also large oil refineries and other industry nearby, taking advantage of the shipping. Tesoro’s Los Angeles Refinery dates back to 1923, an era when oil drilling in and around the bay created a boom here. It is now the largest refinery on the West Coast. After we get past the industrial area, it becomes a typical commercial strip with fast food, gas stations, and old motels leading up to the Los Angeles River. After we cross the river, we finally arrive at a residential area and the City of Long Beach. Just another mile or so brings us to the formal end of our trip, at Atlantic Avenue. Perhaps because this was the longest US-numbered highway, perhaps because the Grand Army of the Republic organization had adopted it, someone installed a plaque to mark the end of the highway. It was dedicated in May, 1953 and reads, in part, “This monument marks the western end of a coast to coast highway, extending a distance of three thousand six hundred fifty-two miles, through fourteen states.” The occasion was a gathering of five service-related organizations, including the Sons of Union Veterans of the Civil War. The plaque was originally located in front of the Municipal Auditorium, but when that building was demolished sometime in the 1960s, it was moved to the Long Beach Performing Arts Center. It’s interesting to note that neither of these buildings was at the corner of the Pacific Coast Highway and Atlantic Avenue, where maps have shown the actual end of the route. Because of this, some have theorized other locations for the original end of US-6, such as the interchange of the Long Beach Freeway at Pacific Coast Highway, or the Los Alamitos traffic circle, or even south of the Pacific Coast Highway at the Performing Arts Center. But this corner of Pacific Coast Highway at Atlantic Avenue seems most reasonable, as it also seems to mark the end of the former US-91. Highway US-101 ALT continued in both directions on the Pacific Coast Highway back in 1962; it is replaced today by CA-1. Route US-91 used to run from Long Beach to the Canadian border north of Sweetgrass, Montana, but it has been shortened at both ends and is now a very minor route of just 163 miles from Brigham City, UT to Idaho Falls, Idaho. It was eliminated in California in 1964, while the northern end was shortened in 1974. We traveled a portion of it from Springville to Spanish Fork, Utah back on Day 33 of our US-6 journey. I’ve already had dinner, so it’s time to look for a motel. We passed a bunch of old motels on our way in, but most looked a bit too rundown. I’ll cruise around the Performing Arts Center and see if there is something interesting downtown. And I’ll see you again tomorrow for an Epilogue and some thoughts on what’s next for Roadtrip--'62 ™! Vin Scully, longtime broadcaster for the Los Angeles Dodgers, discusses the 1962 opening day of Dodger Stadium.